After wading through a maze of complex Linux tomes that are geared toward experienced Unix administrators, I finally found an excellent tips and tricks guide that can walk a novice through the maze of Unix commands. This book is easy to follow and makes using Linux operating system a breeze rather than a painful austerity. Highly recommended! I’m glad people are finding the book useful! Thanks for the feedback Ben. Check out Easy Linux Commands for yourself, only $19.95 from Rampant TechPress. 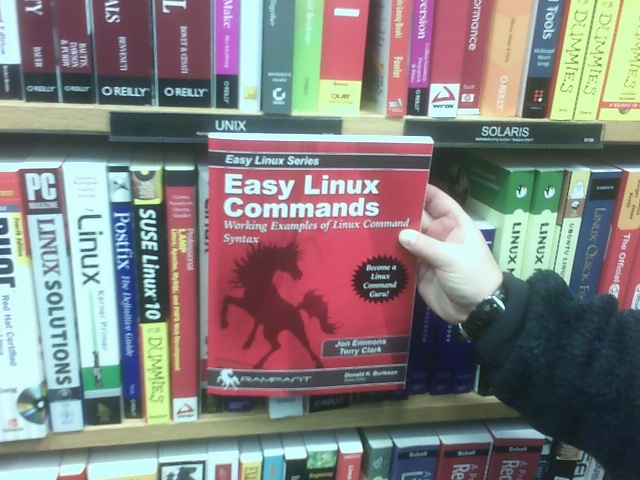 Easy Linux Commands – Now On Shelves! My book Easy Linux Commands: Working Examples of Linux Command Syntax is now on shelves, as seen in this picture from Borders Book and Music right down the street from my home in Concord, NH. Written by me and Terry Clark this book is part reference and part tutorial encompasing everything from basic file manipulation to administrative commands. New users to Linux and old-school Unix engineers alike will find value in this book. The author did a tremendous service representing this rapidly growing technology in an easy to read, easy to follow humorous format. Page to page there are examples of basic Unix commands and obscure Linux features available to most builds. Having built my career in deploying “Enterprise Class” Unix based solutions for today’s high availability needs, it is refreshing to learn some new tricks and be reacquainted with old tools built discussed in this book. I recommend it to entry level and veterans alike. The book is available in major bookstores (although any bookstore should be able to order it for you) and can also be ordered from the publisher for just $19.95. That’s 30% off the cover price! Thanks to Zach for snapping the pic and sending it on to me. Posted on December 19, 2006 December 19, 2006 Categories Information Technology, System Administration, UNIXTags book, command line, Information Technology, Linux, linux commands, Redhat, sysadmin, System Administration, Technology, ubuntu, UNIX1 Comment on Easy Linux Commands – Now On Shelves!